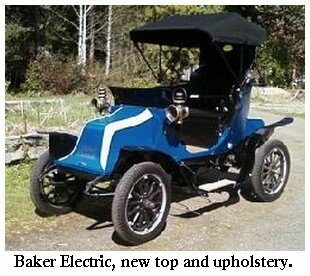 The Baker electric car might be the first electric car that died, back in the early 1900's! I'll be talking a little later with a man who's brought one of these beauties back to life. 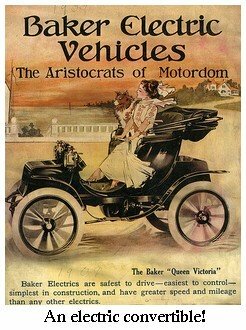 The Baker is a prime example of a Brass Era (c. 1900) electric vehicle made in the United States, when cars were trying to take over the transportation business from horses, and electric vehicles were way ahead of gas-guzzlers in the race. Back in those days, gas-guzzlers were the cars with unpopular "limitations", like needing to be started by cranking manually standing outside the car in all weather, and like needing to carry around a supply of flammable liquid fuel without a gas station on every block. Electric vehicles, by contrast, had the usual list of attractive features; they were quiet, safe, with low operating costs and high reliability - just like today's EV. What yesteryear's EV didn't have was RANGE. The nation's new and growing highway system was demanding more and more range from its vehicles in order to connect all the towns and cities with one another, and with electric vehicle batteries being what they were then, gas guzzlers were bound to win over electrics in that respect. So once Detroit introduced the electric starter so the driver could "crank from your seat instead of the seat"? That was it. 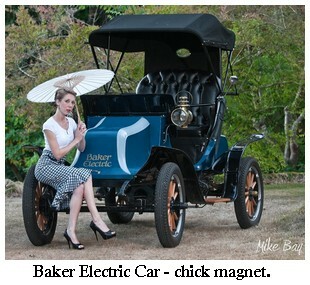 The Baker electric car was dead. 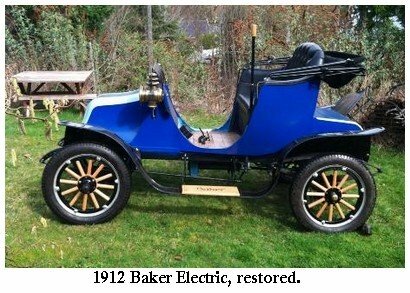 I'd like to introduce you now to a guy from my old neighborhood (Brownsville, WA) who has restored a 1912 Baker Electric Car to all her former glory and perfect condition, and takes her around to car shows for competition and we have some sweet photographs to share. The old girl still has her original motor and controller, too! Lynne: Hi, Art. 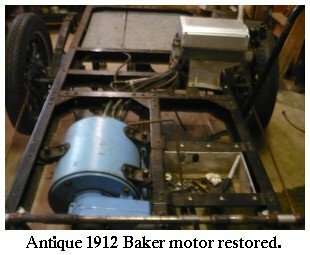 Is this 1912 Baker your first antique electric car restoration? Art: This is the first electric car, I've done Model T Fords before. No name. We just refer to it as "the Baker". Yes, and it has a forty mile range on a charge. So do you drive it around town? I drive it a lot in the neighborhood. I drive it to Bremerton every once in a while for events. Sometimes to Silverdale or Poulsbo. 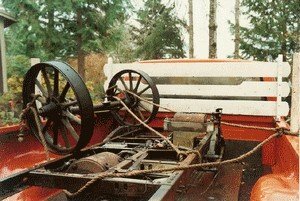 I have driven it to Port Orchard twice. That is about the limit for it's 40 mile round-trip range. Did it come with original equipment like motor, controller, batteries? Motor and controller are original. Batteries are new Trojan deep cell golf cart type. 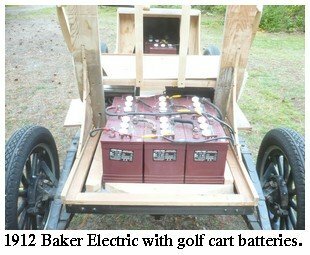 The Baker electric car restoration started with a pile of EV guts in the back of a pickup. And the motor AFTER the paint job! 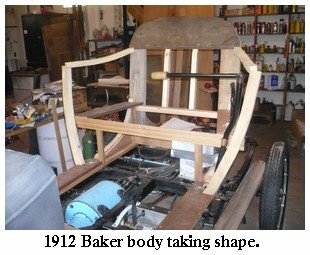 The Baker's body restoration in progress. Art, the restoration photos are great! 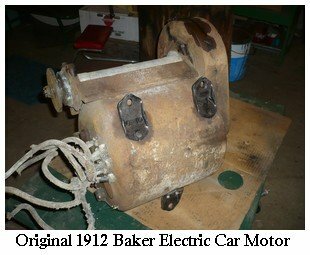 Can you tell me a little about the original equipment of the Baker electric car? It came with folding top (two types optional), leather covered fenders and dash board, electric powered carriage type lights, optional hard rubber tires or pneumatic tires, electric bell, controller is 6 speeds ahead and 3 in reverse. A battery charger would have been optional but necessary. The originals were quite large and heavy. It goes 40 mph now? Only downhill. It does about 32 to 35 mph on the flat, and only about 8 or 10 mph uphill. How fast did it go in 1912, with roads the way they were then? About the same. Remember, the folks buying originally had just sold their horse and buggy so these speeds were very acceptable. Are antique cars legally allowed to go faster than NEVs? I don't know why not, if they are able. 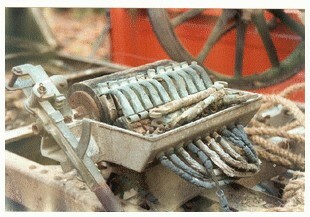 Most contemporary electrics were the same slow speeds as the Baker. Although, Baker did hold a speed record of 100mph at Daytona Beach in the day. How different (or similar) is an antique electric car from a modern electric car like the Nissan LEAF? Both my Baker and the Chev Volt go 40 miles on the home charge. The Volt has a windshield and cup holders. Modern electrics go much faster and in more comfort. Thank you so much for sharing your beautiful antique car with us, Art! Back to Electric Car History.